The taciturn, brightly-hued Academy Award winning Pink Panther is another of America’s cultural icons, beloved by millions throughout the years since his debut. From the instantly-recognizable and infectious theme song to the higher-end humor, this pastel feline is a powerful part of animation history, as well as being responsible for imparting a slew of life-lessons to young viewers. Here are ten of the things that children can, and have, learned from watching the Pink Panther. Silence is Golden – The Pink Panther only speaks in two of his films; the rest of the time, he relies on the intelligence of his viewers and the expressiveness of his body and environment. This is a perfect example for kids about actions speaking louder than words. Good Manners are Imperative – Kids watching the Pink Panther will immediately learn that he finds good manners to be a non-negotiable personality trait. The importance of behaving in a calm and polite manner is stressed, even to the littlest viewers. Stoicism is a Virtue – Despite being constantly bombarded by potentially-irritating situations, the Panther is able to maintain his cool to an impressive degree. Though he does become visibly miffed when humans are meddlesome or offensive, he still reacts with grace and sets the example for children that they should do the same. Attention to Quality Pays Off – Eschewing the quick and cost-effective methods of their rivals helped Fritz Freleng and his cohorts win an Oscar for the Pink Panther’s very first outing, Think Pink. This attention to detail and uncompromising level of dedication sends a great message to kids about only submitting their very best efforts. Cartoons Can Be High-Brow – In contrast to the other cartoons in the Saturday morning line-up, Pink Panther shorts were more high-brow and intelligent, even appealing to adults. Watching these shows helped kids understand that there was more to life than falling anvils, and that cartoons could be smart while still being funny. Popularity Can Be Used For Good Causes – Whether he’s campaigning in New Zealand to end childhood cancer or lending his likeness in the US to breast cancer awareness charities, The Pink Panther is no stranger to public service. This socially-conscious behavior is important for children to witness, helping them to learn that they should use their good fortune to help others. Make Your Own Way – In almost every way imaginable, The Pink Panther shorts were, and still are, quite different from their peers. Seeing the originality and ingenuity displayed by Pink Panther workers in contrast to the surrounding shows can help kids see the importance of carving your own niche. Some Things are Timeless – Kids watching vintage Pink Panther films are likely to notice the lack of confusing, dated cultural references when compared to other cartoons of its time. This is because the studio deliberately used vague references to current events in an attempt to use understated and timeless humor. Never Give Up – According to historian Jerry Beck, “Classic animation pretty much died in the ’60s, everyone had kind of bailed out. But his creators didn’t rest on their laurels. They didn’t make the cartoons to look like Warner Bros. cartoons, or Disney cartoons, or the UPA look of Mister Magoo and Gerald McBoing-Boing. They came up with their own clever new style.” This persistence is a great message for kids about the rewards of never giving up. Use Limitations to Your Advantage – Part of the trademark style of Pink Panther cartoons came about as a result of the limitations of the Saturday morning format that creators were forced into. 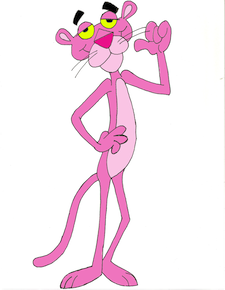 A lesson about turning adversity into success can be found in the history of the Pink Panther. With its strong adult following, it isn’t just kids who can, and are, learning lessons from this pastel feline of the cartoon world.